This exhibition consists of two bodies of work. The first focuses on the Ghasemi brothersʼ individual paintings, reflecting their personal style, artistic space and subject matter. The second showcases their collaborative paintings and sculptures titled Red Room: Migratory Birds. This essay aims to analyze their collaborative body of work, whereby their subject matter expands from local to global to ad-dresses the perils of forced migration. With more that 60 million displaced people worldwide, the issue of migration is in-creasingly shaping todayʼs world. This crisis has impacted elections, reconfigured identities and divided nations. Yet, it has also created art. "In the context of this de-humanizing rhetoric surrounding immigration and the increasing fatigue of com-passion", (Ermine Yeter, Oxford University) the story telling power of the visual arts and its ability to encourage empathy is critical. "Instead of solidifying the polit-ical boundaries between them and us" (Ermine Yeter, Oxford University), contem-porary art aims to bring the two closer together. With little progress towards a truly humanitarian response to this crisis, art is the soft power needed to build em-pathy and shape our world. Red Room 2: Migratory Birds reveals the migrantʼs nightmare. In this body of work, the Ghasemi brothers beautifully portray the invisibility, displacement, and pain of these "disposable populations". Using a visual vocabulary, they represent the struggle of assimilating to oneʼs unfamiliar surroundings as a nightmare. 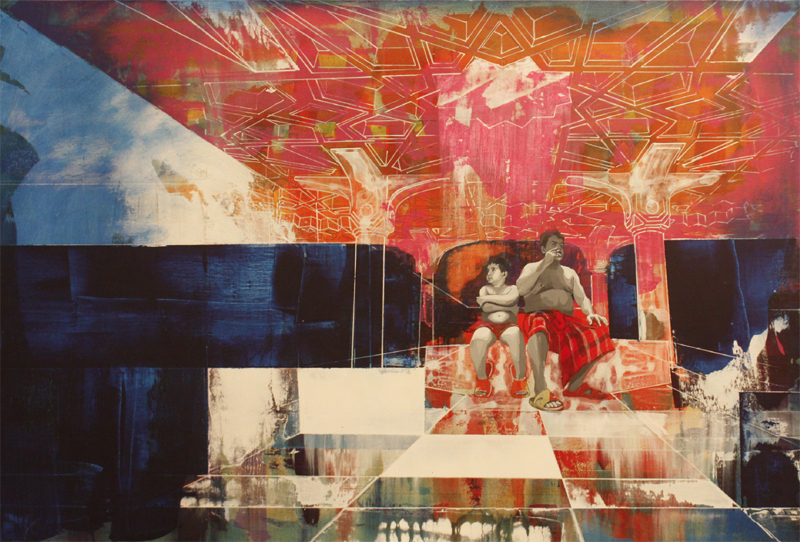 The human protagonists are shown as giants; naked, obese, lost in thought and trans-planted into a surreal and unfamiliar landscape. 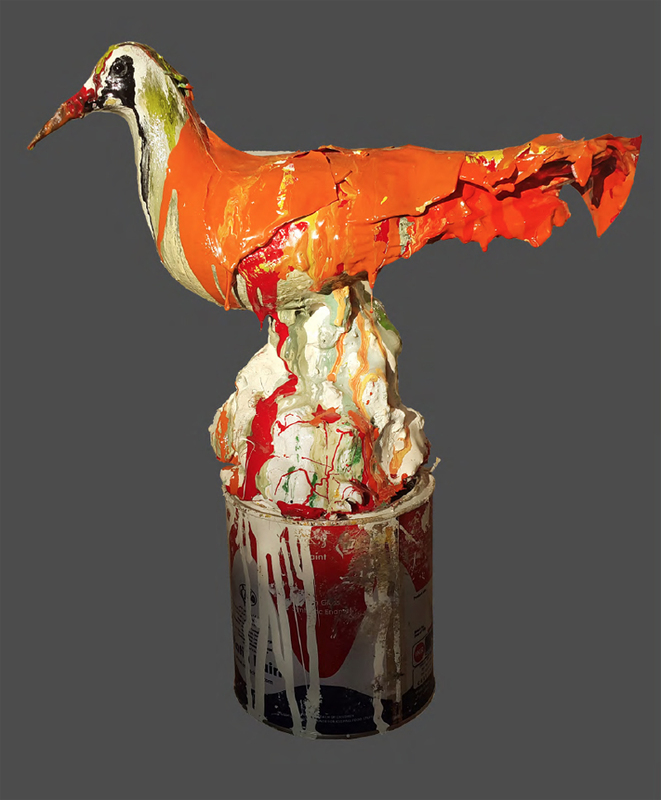 The bird sculptures in the show look trapped, stuck in place by various forms of thick and heavy glue. The monu-mentality of the figures are then satirical, drawing on the magnanimity of todayʼs migration crisis, while mitigating the loneliness of those that are displaced. The Ghasemi brothers also allude to both traditional Iranian painting with references such as "Gol va Bolbol" (bird and flower) as well as contemporary art to communi-cate with their audience in an original and personal manner. Much like how movie director Kubrick refers to the postmodern theory of the death of the author in "The Shinning", the Ghasemi brothers also reference a red room, and subsequently invite their audience to participate in the creative process. In these works, the art-ists act as "author", and challenge us to enter in dialogue with the spectacle that they create.